Whenever I have to get screenshots of a web page (for a presentation, a blog post, error messages), I use a Mac. I love the Grab software, especially the hot keys. With the Screen Capture Elite plug-in for Firefox, though, I can do most of it on my PC. You can take a screenshot of the entire web page, only the section that is visible, or choose your own selection. No more taking multiple screen grabs and stitching them together in Photoshop! After installing the plugin, a little camera icon will appear in the bottom toolbar (in the above image, it is the middle icon between Zotero and Firebug.) Right click on the icon and choose Options. 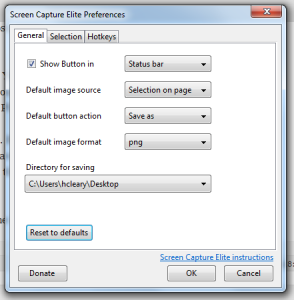 You can choose which type of screenshot and save method will the be your default. You can also assign hot keys to the commands, but test them for conflicts; many other plug-ins (and Firefox itself) use hot keys. Usage: Click on the icon and it will take your default screenshot. Right click on the icon to choose from all of the screen grab options.